The husband and wife team of Thomas D'Agostino and Arlene Nicholson are experienced paranormal researcher/investigators with 34 years experience and over 1000 investigations performed. Tom's interest in the paranormal began at a very early age. After spending six days in an extremely haunted house,Tom studied social, physical and esoterical sciences while gaining a degree in political science. Tom then studied and practiced the art of research and investigation in various places gaining more experience before breaking out into the field. Arlene has many years of experience in the field and is a professional photographer whose experience has helped countless people discern between false and positive photographic evidence. All investigations are free of charge and confidential. We do not advertise that we are going to your place on facebook, through emails, etc. The only people who know you contacted us are us and you. Please go to contact page and fill out form so we can get in touch with you ASAP. Below are some investigations we have performed. Confidential investigations will never be posted or advertised. Any posted investigations are at the request of the owners or public places. This is but a few of the investigations but should give you a good idea of places we have been. To learn more about the haunting at the Tavern on Main, click or copy and paste link below. 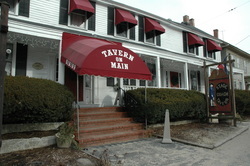 Known as one of the most haunted sites in New England and arguably the most haunted in RI, the tavern is host to several spirits from different eras. The structure was built as a private home in 1760. Cyrus Cooke turned it into a tavern in 1799. It was the headquarters for Thomas Dorr and the site of the Dorr rebellion in 1842. H.P. Lovecraft was known to stop at the tavern en route to Pascoag and west Glocester. The tavern now serves some of the best cuisine you will ever savor. Perhaps that is why the ghosts have stayed on. Amonr the spirits are that of a little boy who is seen in the dining room, Ladies room and taproom, a woman who is seen and heard sobbing in a corner booth, a man dressed in 19th century clothing, a woman seen in the pantry, and many other unseen entities that have made their presence known to staff and countless patrons. Arlene and I have investigated the tavern many times and always have something to tell of the spirits that reside within its walls. Below are just a sample of the incidents witnessed during these investigations and by other witnesses. *Box of coasters in Dorr room were thrown over the partition into the entrance hall below. *Man in Colonial garb was witnessed by several people. *Footsteps heard running up wall by several witnesses. *Plates flying off trays during ghost dinner Oct 27. *Arlene’s Daughter-in-Law, Suzy, had someone tap her on the shoulder upstairs, yet we were the only ones there at the time. *Investigator struck by washboard during one of our presentations. *Edison box answered “My name, ALICE” on two separate occasions in back booth. *Sobbing from dining room on many occasions after is has been closed for the evening. *Benches creak in dining room after hours as if someone is getting out of them. *Girl in bathroom talking to ghost boy. *Domenic saw ghost boy outside ladies room after opening up for the day. *Many witnesses have seen woman in back booth. *Coffee cup and wine bottle struck one waiter. *Chris and I saw someone walk up back stairs before a ghost dinner but when she ran to catch them, there was no one there. *A child saw a dog lying next to a couple at a table where no one else saw this canine. The lady felt the warmth of the dog at her legs. *A ketchup bottle flew across the room and hit a diner in full view of many witnesses. *A group at the King’s table saw a man sitting in one of the seats next to him. He then vanished. *Metal scrubber went missing; found wrapped deep in piano wire of piano. *Eva Marie set menus on tables and went to kitchen. Upon returning menus were strewn everywhere, including in the ice bucket. *Debbie heard a voice call her name in empty taproom. *Sink turned on several times by itself. *Glass shattered in taproom after an investigation. *Compass in taproom began spinning at the spot where a tragedy once took place. *One bartender, while closing brought up a case of beer to fill the coolers. when he turned around one of the bottles was on the floor spinning like a top. *Large TV on shelf flew off and hit bar right next to a patron who was "boo-hooing" the ghosts. *During an EVP session in the taproom, an iron decoration flew off the table beside us. *Couple at gas station saw little boy in taproom window while placed was closed. *An audible “NO” was heard when Arlene asked a question during a reading in the taproom. *Ghost seen in pantry on several occasions. *Hair on arms and neck stand before each incident. *Items fly across kitchen from shelves and microwave on shelf. *Shadows and figures are seen moving about the tavern. AT LEAST 1100 PRIVATE RESIDENCES THAT ARE CONFIDENTIAL!!! AND WRITE ABOUT THESE PLACES.